Tabbed Browsing for Excel brings tabbed browsing for open documents in Excel, Word and PowerPoint through and Office add-in. The tabbed browsing functionality for Office documents is much the same as that of current Internet browsers. The tabbed nature of navigation allows to switch between open documents and files easily and saving time. Flexibility to position the tabs: above workspace, below workspace, left of workspace or right of workspace. The color of the tab bar is customizable. Lock the tab in Word and Excel. More than 11 Tab styles can be selected. Set to hide the Tab bar while there is only one Tab. Close Tabs by clicking middle mouse button or double clicking left mouse button on the Tab. Create new Tab by double clicking left mouse button on the blank area of Tab bar. Drag the Tab from one Tab position to another Tab position. Modified workbook Tabs are marked an asterisk (*). A large range of customization and shortcut options for Tab management. 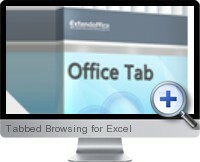 Tabbed Browsing for Excel is compatible with Microsoft Office 2003 or higher.